I have learned that some people don’t see me as a typical dog owner. I’ve done some embarrassing things in the name of adventure and what I see to be responsible dog ownership. I’ve made some mistakes (most of them involving dog poop). I go above and beyond so that my small dogs can enjoy hiking trails just as much as the big dogs. I’m hyper-vigilant about their care and am pretty sure some would see the amount of money I spend on Chester and Gretel as obscene. I dote on my dogs as if they were children (although I DO know they are really dogs). Some of you will read my confessional and say “Me too”. Some of you will laugh at me instead of with me for being so “over the top” when it comes to caring for my dogs. Some of you will just think some of these things are gross. There is one thing some of you might even be mad at me for. That’s ok.
I’ve eaten jerky treats meant for dogs. Once I did it out of curiosity. Another time I did it on the trail because I was hangry. It was the natural kind – just dried, cured meat – and didn’t have any sodium. That’s what it tasted like too – plain ol’ dried meat chunks. I put a doggy sports drink mix in my dog’s water when we hike. When Chester and Gretel get amped up on the trail they are more interested in checking out the chipmunks than drinking water. They need to stay hydrated so I put Animal Naturals K9 GoDog (affiliate link) mix to add enticing flavor, electrolytes, and carbs. I really does make them go with more gusto. I’ve pushed Gretel in a stroller on a hiking trail. Gretel injured her back and wasn’t allowed to hike for a while. The poor girl was going through withdrawals I think so I put her in a stroller made for dogs so I could take her into the woods. I picked what I thought was a flat park trail but it turned out to be really steep in some areas. I pushed Gretel up and over hills and roots for only 20 minutes until it got to hard to wrangle. I got weird looks but I tried not to let them bother me. I bought a $65 high performance outdoor blanket for each dog . Yep, that’s right. No flimsy fleece blanket will do for Chester and Gretel. Little dogs with minimal hair get cold out in the elements so they need something to keep them warm when they are not moving. Their RUMPL blankets (affiliate link) are made with Ripstop Nylon, synthetic down fill, and have a water repellent finish. My excuse for buying such a high-end blanket is that it packs down smaller so it fits in my pack better and might be slightly lighter than a fleece blanket. The reality is that I want Chester and Gretel to look cool when lounging around on rest breaks and at camp. My hiking backpack is at least 5 lbs heavier because of my dogs . Chester and Gretel are small and have long, fragile backs so they can’t wear a doggy backpack and carry their own stuff. I schlep their dog food, water, food , and gear into the backcountry every time we go hiking. I secretly revel in the attention I get because my dogs are so fit . I am proud of the fact that Chester and Gretel aren’t fat. Every time I take them to the vet, I’m told how wonderful and rare it is to see a Dachshund that’s a healthy weight. I’ve had people on the street and trail ask me what type of dogs Chester and Gretel were. They didn’t recognize they were Dachshunds because they are used to seeing ones that look like plump sausages. I beam inside every time. If I had to choose between hiking with my dogs or a human, I would pick my dogs every time. I would even choose hiking with them over my husband. I think he knows it too. I’ve been “that guy” and left a full poop bag on the side of a trail… ONCE. I’ve been hiking with my dogs for 13 years. I always pick up my dog’s poop and carry it out. Except for that one time I didn’t. My hike was long and it was just starting. I picked up the poop and set the bag by the trail where I would see it on the way out. Well, I didn’t. I went back to look for it and couldn’t find where I put it. I had to just go. I seriously lost sleep over this. It was three years ago and I still think about it sometimes and feel bad. Bad etiquette and being a water quality specialist and knowing the dangers feels hyprocrytical (because I also get mad when I see bags left on the side of the trail). I pretend that someone just picked it up for me but it’s probably just sitting there…. still… forever… in my mind anyway. Ha, ha. I left a used poop bag in my hubby’s car! My hubby came home one day and exclaimed that he found a bag of dog poop under the front seat. I had borrowed his car, tucked a full poop bag under the seat until the next available trash can, and forgot about it. There it sat. For like a week. The funny thing was, we had recently loaned the car to my step Mom and she said, “I thought the car just stunk like dirty boy” when we told her a poop bag had been riding in the car with her. 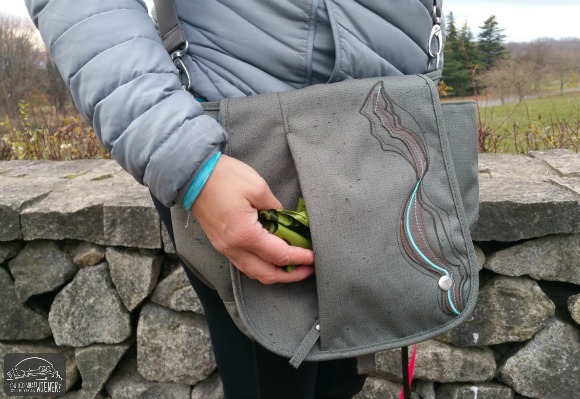 I left a full poop bag in my purse… and discovered it during lunch with a friend! I used to have a designated Dog Mom purse that I used only when I was walking the dogs. I am so often going places and doing things with the dogs that it became my regular purse by default. This awesome purse has a ton of pockets, including a discreet pocket on the front flap that I sometimes tuck a full poo bag into until I get to the next garbage can. One time (ok… who am I kidding? It’s happened more than once.) I was sitting there with a friend at lunch and caught a whiff of “dooty”. There I was, in a restaurant smelling poo and hoping no one else could, with no appropriate garbage can in sight (there wasn’t even one outside of the restaurant door). How about you? What are your dog Mom confessions? Oh my, I can imagine looking for a tissue in my purse and pulling out a full poop bag. That is hilarious that the car smelled like a “dirty boy”. I guess dirty boys smell like dog poop? Ha, ha. Great post! I love the special doggie blankets…where can you get them? I put a link there so you would know. Just click on the orange underlined word and you will be taken to where you can but it. I have no kids but I have 2 dogs. They are fit and healthy which I love because we take them everywhere. MY late almost 15 year old Munchen would walk one way for a couple of miles but then I had to carry her home! 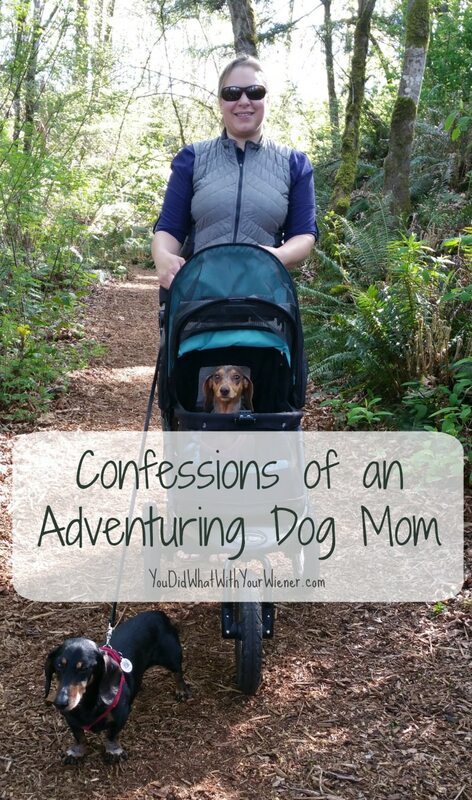 So I have had a dog stroller for the last 7 years, she and I loved many miles and I didm;t care if people looked because it was great fun for both of us! As for having the best, if you are doing serious walking, hiking, and camping they need good stuff that is made for them! Good for you for taking such great care of your beautiful pups! People will always judge, who cares, it is not their for or their money! In 2004 we had 4 hurricanes “tease” us. On one hurricane evacuation we found the hotel me made reservations at 4 hours away did not accept dogs. At the time we had one doxie and a small terrier mix. After checking in we went down the road a found a pet store and bought a dog travel bag, stuffed dogs in one at a time and snuck them into our room. Love your confessions. I especially love your pride over your dogs’ fitness level. Revel in it! You work hard to make sure they’re fit (and help other dogs get fit). Do you think electrolyte water would be good for dogs at BlogPaws to offset some of the effects of heat? Good thinking. GoDog wouldn’t be appropriate though. It’s meant for dogs that are expending a lot of energy and has a significant calorie content because of it. There is another one that is just electrolytes but I forget what it’s called. The best bet if BlogPaws wanted to do something about the water for the dogs would be to use Pedialyte. It would be cheaper than a dog-specific product. I once used litter to pick up the dog poop because I forgot a bag! That’s so funny about the dirty boy thing! I’ve tasted dog treats, too. There was this one coconut flavored one that wasn’t half bad! The things we do for our dogs and with our dogs! We are not crazy, just dog lovin’ humans! Love your confessions. I was wondering if you had a recommendation for a stroller? I have several handicap dogs and would love to take them with me but I am limited with what they can do. Thanks. Our stroller is the NV from PetGear. It’s one of the fanciest ones on the market with rubber wheels and shocks. I got it mainly for when Chester gets old and can’t walk much anymore. I couldn’t do any real hiking with it but at least we wouldn’t have to stick strictly to pavement. They make some other good ones too. Dogger is another brand that’s similar and is high quality. None of what you have done seems nutso to me. Perhaps that’s just because I have done similar stuff and others that you never even mentioned! I did ask people to leave their on confessions… so where is yours? Make it juicy. Ha, ha. Okayyyyy… Henrietta and I drink from the same water bottle when we’re walking AND we share the same popsicle or ice cream cone when we indulge in one. How’s that?! This is just normal stuff, isn’t it?! LOL! I’ve also left a poop bag on the side of a trail when we were at the very beginning – it was also gone when I went back. It also happened again last weekend but I threw it out. Redeemed myself. I throw birthday parties with 15-30 people AND dogs every year for his birthday. I can’t sleep without Wynston. I’ve also tasted dog treats – they were like animal crackers. Strictly natural, human ingredients. My whole life is a story of dog mom confessions. It’s great! This is so great. I think I told you this, but I left a full poop bag in my doggy purse in the house for a week. Yeah, J wasn’t happy . He kept cleaning and cleaning, not being able to figure out why the house smelled so bad in one area. I think I told you this too… one of those lunch date poop mishaps was with you. At that point, the poop bag had been in my bag for 2 or 3 days. Ha, ha. OMG you are wonderful! 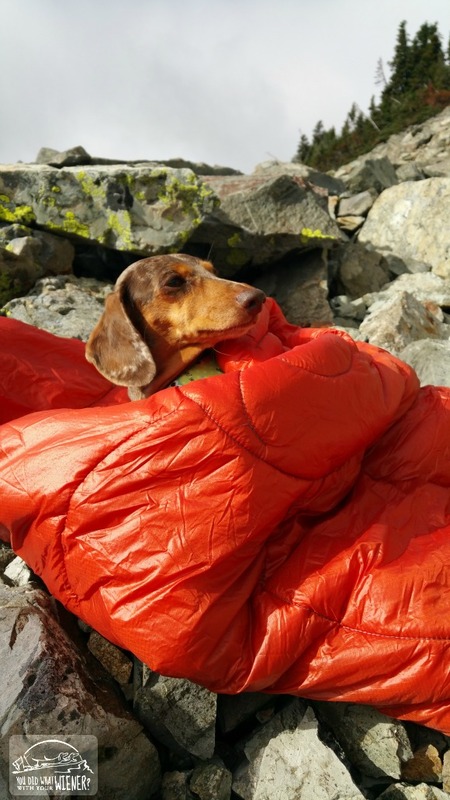 I really want Matilda (my dachshund) and I to go hiking with you guys! haha! Keep doing what you’re doing! I have to look into one of those blankets too! Yes, it is the truth a lot of the time. A very CONVENIENT truth 🙂 I saw your pictures of your GSD puppy. Love the ears! I’m just entering into the golden retirement years with Chester. It’s my first time going through this experience as an adult. It’s a little emotionally conflicting for me. All the feels are new 🙂 It makes me sad but happy to still have him around too. He still loves the outdoors but can’t go as far and and fast as he used to. It was my first time as an adult too losing the ol’ girl! I was 100% sure though that she had had a great life and dignified exit. I can’t say it’s easy since you kinda expect it from the oldies but keep spoons in the freezer for your crying eyes and lecture the any new dogs on WWFD (What Would Falu Do?). Sorry to get off topic but I had to share!